From left: Caroline Waldrop, Mary Katherine Horton, Jordan Susce and Marilyn Steed. Spain Park shot a two-day round of 445, claiming its first title in eight years and narrowly defeating cross-town rival Hoover. Photo special to the Journal. 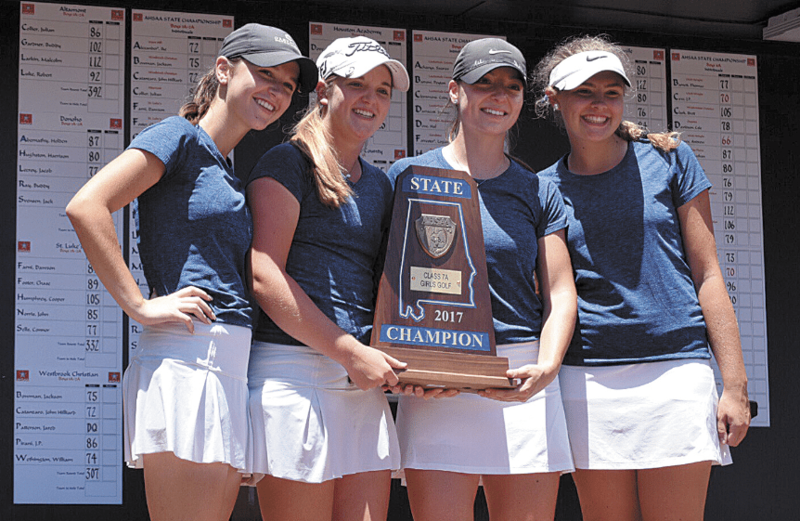 After its last title in 2009, the Spain Park girls golf team had found the state championship trophy to be as elusive as the Academy Award was for Bob Hope. The drought for the legendary entertainer never ended. But the Lady Jags’ drought came to an end May 17 at the Robert Trent Jones Grand National Golf Course in Opelika. Shooting a two-day round of 445, Spain Park claimed its first title in eight years, narrowly defeating cross-town rival Hoover, which fired a collective 451. Spain Park helped itself with a strong first-round score of 218. Senior Jordan Susce had the Lady Jags’ best round that day, firing a two-under-par 70, along with Caroline Waldrop’s even-par 72 total. Horton led the way for Spain Park on the second round, shooting a 74. Waldrop followed with a 76. Susce shot a 77 and Marilyn Steed – a freshman – carded an 84. Hoover senior Julie Baker was the low medalist runner-up with rounds of 73-74. Virginia Green of Fairhope won the low medalist crown with two consecutive scores of 66. Mychel O’Berry totaled 150 for Hoover, and Carson McKie followed with a 156.